If your backyard feels a little dull or you’re not making the most of your space, why not consider a backyard makeover. While landscaping a garden can be costly there are ways to transform your outdoor area without breaking the bank. Here are some DIY backyard makeovers to inspire your next project. Patios and outdoor spaces can be dressed up with lush greenery and potted plants to add dimension to backyards. Use plants to fill an area or draw attention to a space. Choose plants that are easy to maintain. Consider fuss-free plants such as evergreen shrubs which look great year-round, ferns which can add depth or Bromelaids which are ideal for tropical-looking backyards. Smart plant choices also include lemon grass, which is effective for keeping mosquitoes away. Mix a variety of plants to add texture and interest. Define areas such as dining, cooking, shady lounging and play or pet areas by repositioning furniture and accessories into zones. Outdoor spaces should be an extension of your home and include many of the comforts you find inside. Backyards can be broken up into multiple zones using different textures, furniture and carefully planned out pathways. Adding levels to the space will also help to define designated spaces. Tip: Turn one zone into a staycation spot! 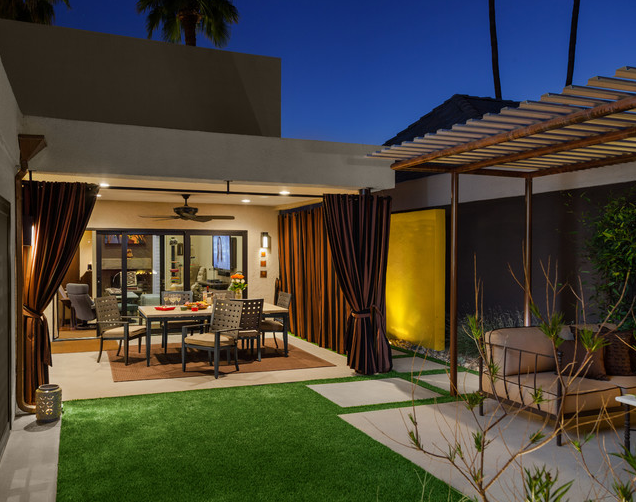 To make your backyard feel like your private getaway spot, use comfy furniture, add a fire feature and lighting and setup a weatherproof speaker system. Build a pallet swing to finish the space. This addition makes a great day bed or reading spot and is a simple DIY job for your staycation spot. All you need is a strong tree branch, two pallets (depending on the size of the swing), strong rope, glue and colourful cushions. Paths can be easily created using pavers, tiles, crushed rocks or bricks and can give untamed spaces direction and a more polished look. Establish zones and interlock them together with distinctive materials or decorative stones to create strong landscaped lines. Get creative with shapes or use edging to further create contrast between sections. Backyard structures, such as pergolas and raised garden beds make great focal points in your space. Draw the eye to these features with pathways and lighting. Functional but not-so attractive structures can be disguised with a little creativity. Turn sheds, walls, pool equipment boxes, air conditioning units and other eyesore items into aesthetically pleasing elements with salvaged materials, paint or climbing plants. Wrapping vines around a structure also provides shade to spaces without making you feel too enclosed. If you’ve got a small outdoor space, you can create the illusion of a larger area with mirrors. Simply place an old mirror strategically in the backyard to reflect the space. Mirrors can also be sourced cheaply from recycling centres at your local tip. Another way to manage small spaces in urban living is to think vertically. Vertical planters can be mounted to walls, fencing or other structures to save space. Grow your own herbs and use hanging baskets or wall pots. According to a study by Houzz, more than half of homeowners are updating their lighting to illuminate pergolas, decking, gardens, pathways and steps. Lighting changes the mood of your backyard, drawing attention to architectural details and serves as a crucial safety feature. Use LED string lights to line walkways. They can be easily attached to garden paths, decks or patio spaces for a well-lit area. DIY backyard makeovers don’t have to be overly time consuming or expensive. Which ideas will you be adding to your space? Leave your comments below. This article is written by Jayde Ferguson, who recommends Great Aussie Patios – Perth’s leading patio and pergola builders. You can catch her on LinkedIn.